Many first time buyers reach out to us because they have found the home of their dreams and want to grab it up while it is still on the market. 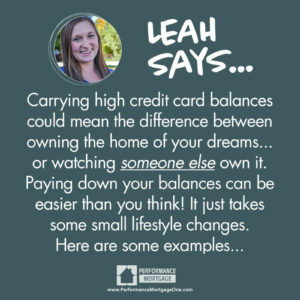 They apply for pre approval knowing that they have a good income and pay all of their bills on time… but there is one major issue that is holds them back from being approved: HIGH CREDIT CARD BALANCES. Keeping balances that are more than 30% of your total available credit can have a major impact on your credit score. It stinks to see your dream home fade away even though you’re working hard to do the right things with your finances, so planning ahead to pay down those balances is important if you think you might want to buy. Paying off those balances is one of the fastest ways to bump up your FICO score, and it might be easier and faster than you think! By making a few small daily lifestyle changes, you can find money in your monthly budget to make it happen! Take your weekly soda habit for instance. Those 12 packs of Mountain Dew or Diet Coke you buy at the grocery store cost $4.99 each on average, and most families buy at least two. That’s almost $10 every week. Doesn’t seem like it would make much of a dent in your debt? Buying those sodas every week adds up to almost $40 each month. That’s $480 every year spent on SODA that you could be using to pay down your credit cards! And how about your daily coffee drink? Last year, Desteni showed us that by brewing your coffee at home instead of buying that sweet, scrumptious latte for $4.25 every day, you could save $1,020 in a year. Pack your lunch too and you could save an extra $50 each week, which adds up to $205 a month or $2,460 a year! That’s a GOOD chunk of credit card debt that could be GONE! To make it even easier, you might consider setting up automated weekly withdrawals from your checking account to pay down the debt… a few dollars each week is often much easier to part with than the big monthly payment… it will feel like you’re buying a soda and coffee, but instead you’ll be bumping up that credit score! Small changes can make a BIG difference. So what are you waiting for? Pay down that debt so when YOUR dream home comes up for sale, you’ll be preapproved to make an offer! Read the whole “Lattes and Lunch Savings Plan” on our blog and learn how by saving only your daily latte money, you might be able to save enough for a down payment for a home! Ready to pay down that debt and be prepared to snag the home of YOUR dreams?? Reach out to us at 937-548-8222 for more information.